because every year different weather, snow condition & race course and distance. It is depend on very changeable mountainous weather. 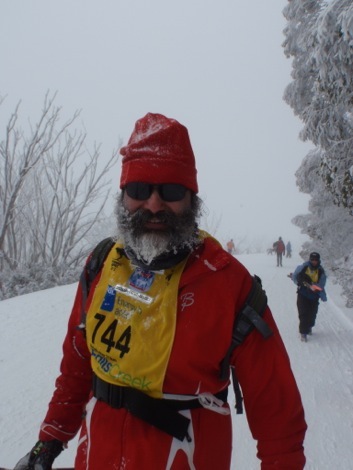 In 2012, we had enough snow depth 150 cm, but very strong wind and snowing had changed race distance shorten, Kangaroo Hoppet 30 km, Australian Birkebeiner 15km. 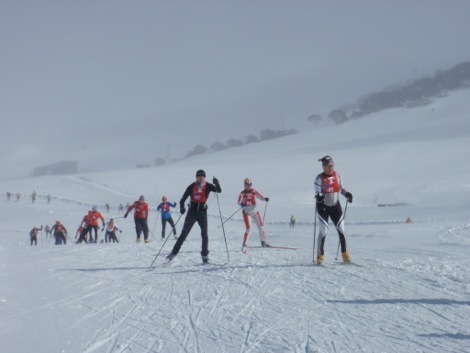 Birkebeiner course is Sun Valley loop-Dam Wall-Watchbed Creek Drink Station-Dam Wall-Finish. Kangaroo Hoppet is double loops of Birkebeiner’s course. Only one regrettable point was new chip system on the front bib, it was easily detached, we need repair work with sewing or stapler by our self. We hope race office to improve this point for next Hoppet! 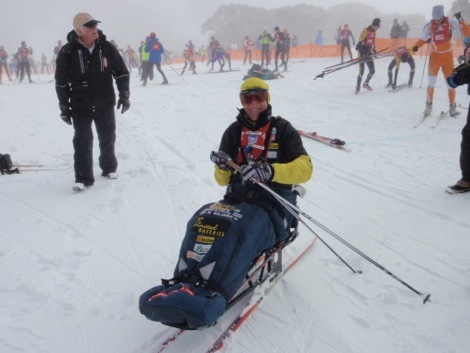 In this race I met two special skiers, one skier is Mr.Preetam SINGH who was from India, he started WL, his first race was Engadin Ski Marathon, he finished Australian Birkebeiner that was second WL race. The other skier is sit skier Mr.Ole Herman RONNEVIG from Norway, he got WL Master title in 2011, then his next Dream is Global Worldloppet Skier. WL family is getting bigger year by year now!! On Sunday snow condition was excellent, it was minus 6 degree in the morning and nearly zero degree at noon, all day sunshine and blue sky. Racecourse was same with CT 51km on Saturday. Race started with wave start on schedule, but wave D & E started together, was it good? This race was more faster ski race than CT, some skiers skied with GPS, they checked their maximum speed was 50 to 60km/hour from Pink Lake for a long decent. We enjoyed Gatineau Loppet challenge both 51 km CT & FT ski race under the perfect condition this year, may be one of the best three good condition of the history of Gatineau Loppet (Keskinada Loppet).